Details of how viewers of the ongoing Big Brother Naija 2018 voted for housemates earlier nominated for eviction have emerged. Miracle, Cee-c, Lolu, Anto and Khloe were the housemates nominated for eviction this week and three out of these five have left the Big Brother house! Following their nominations, viewers were left to vote for their favourite housemates. Lolu, Anto and Khloe were the housemates with the least votes which led to their eviction from the house. 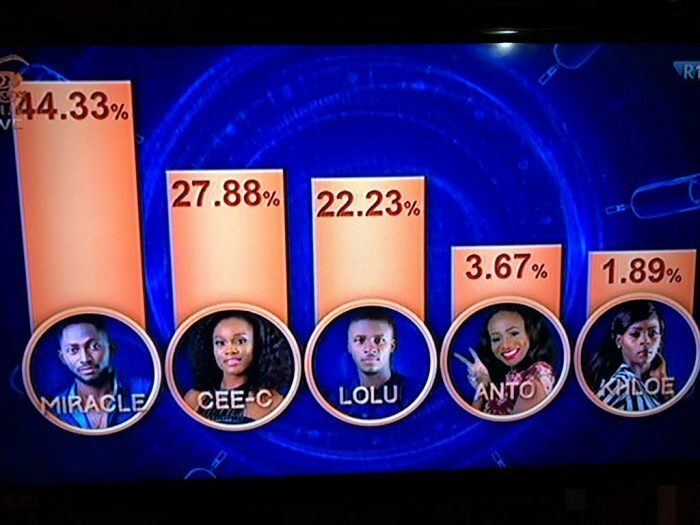 Miracle topped the voting results with a whooping 44.33 percentage of votes, while Cee-C followed suit with a 27.88% votes, Lolu followed closely with 22.23% votes, Anto had 3.67% votes and Khloe came last with a 1.89% vote.